There they sealed the Great Charter, called in Latin Magna Carta. It established a council of 25 barons to see John kept to the clauses like protection from illegal imprisonment, access to swift justice, parliamentary assent for taxation, and scutage limitations. Magna Carta has influenced English law down to the present day. It is one of the most celebrated documents in English history. It is recognised as a cornerstone of the idea of the liberty of citizens. The barons chose their time to put John under pressure. John had lost a battle against the French, been excommunicated by the Pope (1209–1213), and feared civil war at home. He met the barons at Runnymede, 20 miles south-west of London, in June 1215. The negotiation was managed by John's half-brother, William Longspeé, and Elias of Dereham, steward to the Archbishop of Canterbury, Stephen Langton. The content of the Carta was designed to re-balance power between the King and his subjects, but especially between John and the barons. When King John set his seal on Magna Carta he conceded the fundamental principle that even as king he was not above the law. So, when King John put his seal to the Carta on 15 June 1215, that meant kings would not have as much power as before. The Carta also laid down rules of inheritance, and that convictions required some kind of official process. It stated that people had rights not to be unlawfully imprisoned. In other words, the king is bound to rule within the law. Thirteen original copies of the Carta were made and distributed. Only four survive today. The four copies are in The British Library, The Bodleian Library, Lincoln Castle and Salisbury Cathedral. In 2009 UNESCO recognized it in its Memory of the World register. 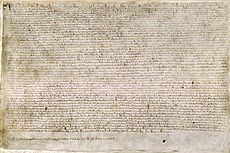 The Magna Carta led to the constitutional rule of today. The Magna Carta was sent out again in 1220 by Henry III. The British Library plans to bring all four copies together in 2015, so that scholars can examine them side by side. Jurist Edward Coke made extensive political use of Magna Carta. John Lilburne criticised Magna Carta as an inadequate definition of English liberties. A 1297 copy of Magna Carta, owned by the Australian Government and on display in the Members' Hall of Parliament House, Canberra. Magna Carta Facts for Kids. Kiddle Encyclopedia.